When an outfit doesn't make it to the blog...I get to wear it EXACTLY twice! Whoop whoop! I wore this first to the TOUS brunc h a couple of weeks ago. That day Gabe had a wedding to shoot so he couldn't shoot me or join me at the event. When we went to LA, I, of course, took it with me. 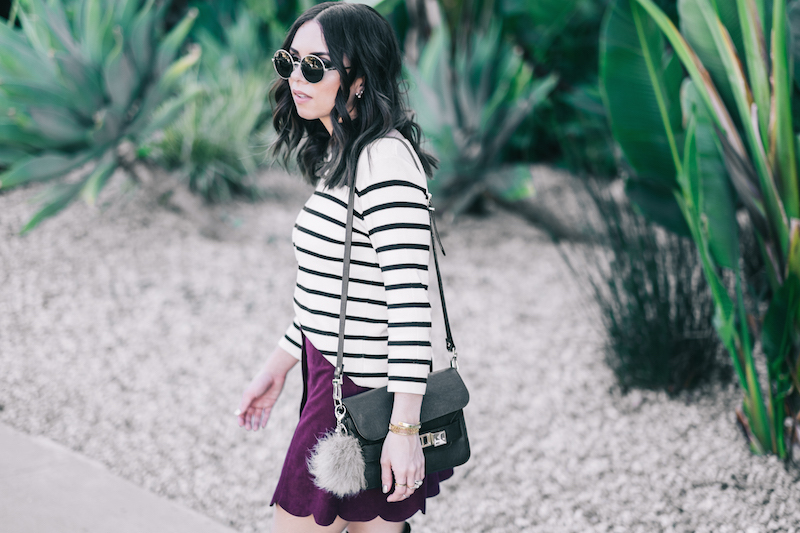 This suede skirt is still one of my favorites...I love the colors and the scallop detail. 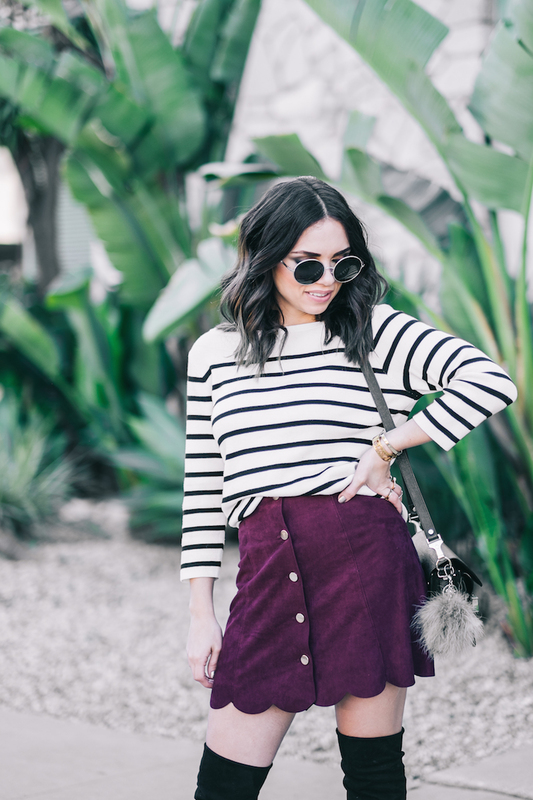 This time I paired with a striped skirt from the Who What Wear collection from Target. I actually got 3 pieces: this sweater, the blue suede jacket, and the long army-green vest. I'm actually thinking of getting a couple of more pieces from that collection, there were some great pieces. 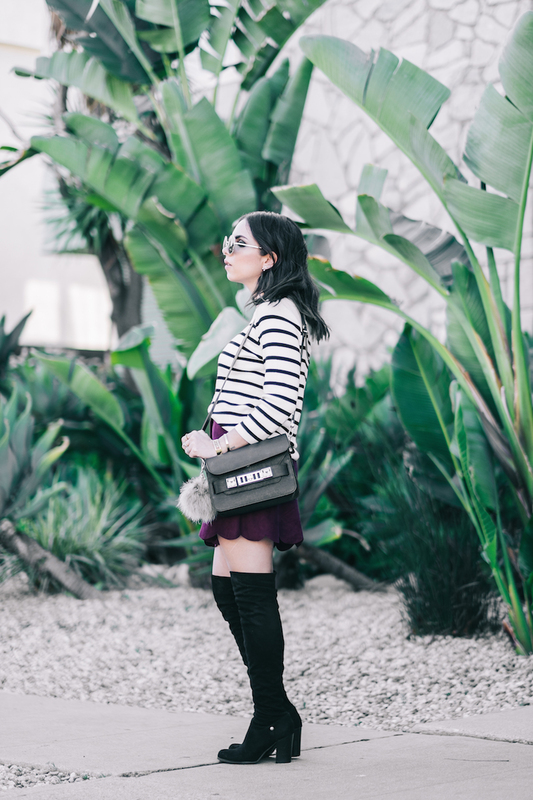 I wore these boots a lot in LA, so get ready for more posts with them! Cuando un outfit no llega a salir en el blog, eso me da la excusa de usarlo exactamente igual otra vez. Y no crean que no repito looks, solo que siento que al ponerlos tan públicamente es como si ya te hubiesen visto con ese outfit...no se si me explico. Esto primero lo utilicé para un brunch con Tous pero Gabo estaba ocupado tomando fotos en una boda y no pudimos tomar fotos. Pero cuando fuimos a Los Angeles la semana pasada, me lo lleve para aprovechar y tomarle fotos allá. Esta falda sigue siendo de mis favoritas, me encanta el color y el detalle en el ruede. Esta vez la combiné con un suéter de rayas de la colección de Who What Wear para Target...una colección que me gustó muchísimo. Compre 3 cositas pero mi Target no tenía mucha variedad y online tiene más piezas. Estas botas las usé mucho en Los Angeles..así que ya saben, las verán en varios looks. ¡Feliz día niñas hermosas!! (y niños si hay por ahí!) BESOS. The best blogger in the world! U are my inspiration many years and because of you and your blog I bought a camera a made blog, because I´ve dreamed about it trough all these years... I ♥ U and your style! El color de la falda es precioso! Me encanta la combinación con las botas "over the knee". Un otufit con mucho estilo y detalles. Un saludo! These dresses are so beautiful! Lovely post! 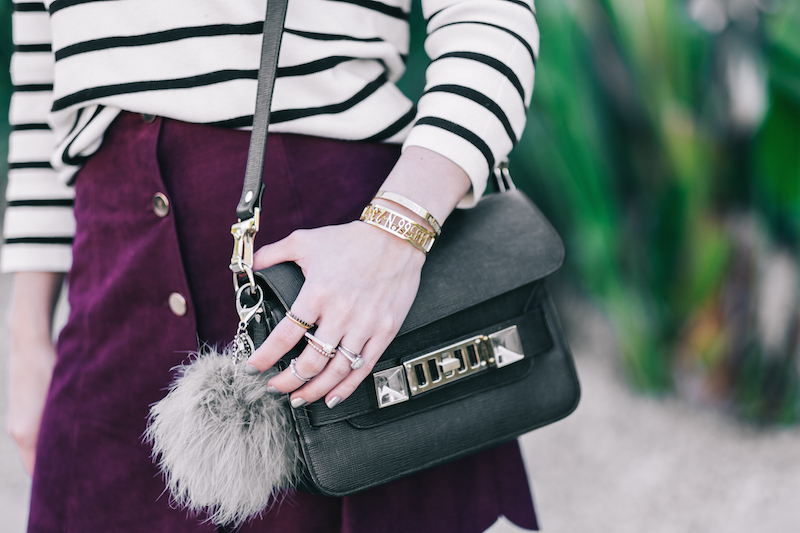 Stripes and burgundy are always a good combo. I love the boots, they're so cute!